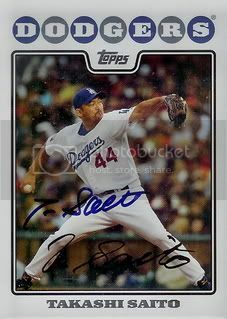 In addition to signing the base card from the 2008 Topps set that we already posted, Takashi Saito also signed his regular card from the 2008 Dodgers Team Gift Set. I saw somewhere where he had taken a break from Spring Training to return home to Japan to check on his family after the earthquake. Hopefully everyone was okay.